I have a lot of boots. A lot. I don’t like when they flop over in my closet because they take up extra space and it puts stress on the shaft of the boot. Have you priced boot stands lately? They go for anywhere from $15 to $250! Even at the bargain price of $15 x 30 (and growing) that’s $450 just to keep my boots standing straight. I could buy – well a LOT of boots for $450. So I started looking around my house for something I could use to keep my boots from flopping over and ended up rolling a magazine and using a couple rubber bands to hold the roll in place. Simple and free. It doesn’t get any better than that! 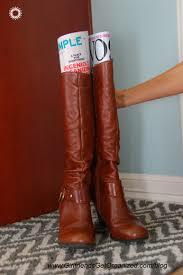 Remove cloth strips, wash well and glue to the inside of cupboard doors to keep them from slamming. Keep an old eraser in the basement or garage for brushing off a workbench. Use on dry-erase message boards. 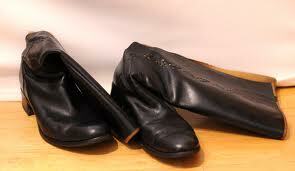 Keep in your shoe polish kit and use to clean dirt off of footwear before waterproofing or polishing shoes. Keep in your car’s glove box to easily erase foggy windshields. I thought maybe Marissa would be making this into a strapless dress, or a winter mini dress (it has long sleeves after all), or maybe a tunic top, but I did not anticipate that she would be making this dress into a fashion forward jacket. 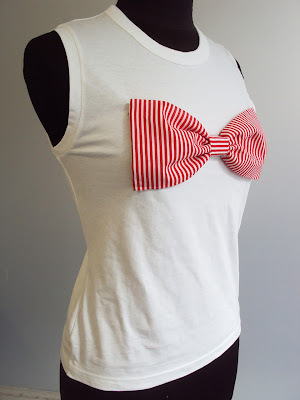 This is a fantastic t-shirt refashion, although I would make the bow larger so that it covers the entire “chestal region” and looks more like a bustier.